Are you a Blogger or Tweeter? Would you like to see yourself at the roof of the world? What would you say if I told you all you had to do was suggest a cool digitasl strategy for a charity? 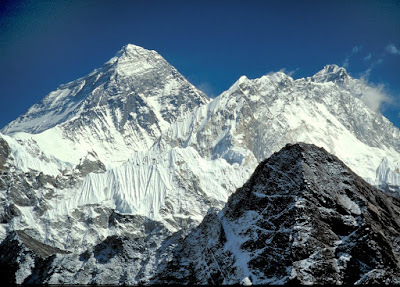 Well here it is, the simplest, most easy, and only, way to get your Blog or Tweet to the roof of the world, Mount Everest! I work for Cybercom and we have been lucky enough to be given the chance to work with Gavin Bate, one of the most inspirational people on the planet. What do we have to do? All we have to do is the stuff we love doing - blog, tweet, code, optimise and market. What is Gavin doing? Well aside from running www.movingmountains.org.uk (an absolutely incredible charity), aside from making his 5th attempt to reach the highest peak on earth, aside from doing just about everything humanily possible to make the lives of those less fortunate just a little bit better, aside from all that, he's giving one lucky Blogger or Tweeter the chance to send him a message with their name and their Blog/Twitter URL where he will photo them on top of the world! Gavin is an expert mountaineer but he isn't a digital marketer, cyber guru or online addict. So Gavin needs help and has asked for ideas from the Irish digital community to promote his current summit bid (eventful). Why would you want to do that though? Well as Gavin said himself, "Unlike many of the climbers out here I don't really need to stand on a bit of real estate over 5 miles up in the sky. My sole reason for doing this is to raise money and the profile of my Charity www.movingmountains.org.uk "
Gavin wants killer ideas that will help him promote his website (and donation page). In return Gavin will promote you from the top of Mount Everest by way of a picture with your blog's name on it or via an audio blog mentioning both your name and your blog's name. Just send a link to your blog post of promotional ideas by Tweet (@gavinbate or @cybercom using #cyb10) and may the best blogger win!